We get about halfway on the trail and we are starting to get fatigued. We have pushed ourselves too hard, too soon. Exhausted from the couple of weeks of planning, cooking, and packing along with almost no sleep the night before makes the hike so much more difficult. We have to stop, eat, drink, and rest. The day is now hot! 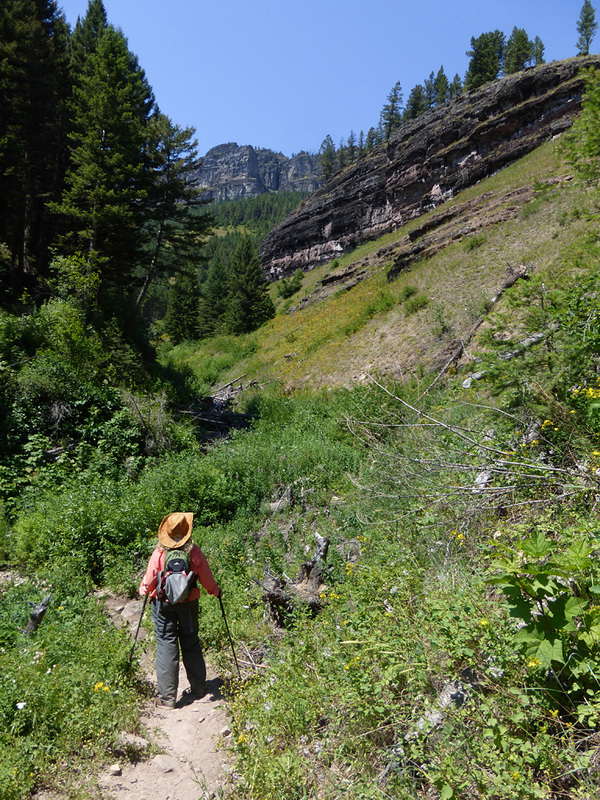 As we hike further into the canyon, we get some seriously beautiful views. The ridge farthest in the background is called Patrol Ridge. Southwest of the ridge is where the cabin sits, so we still have a couple of miles to hike from this point. 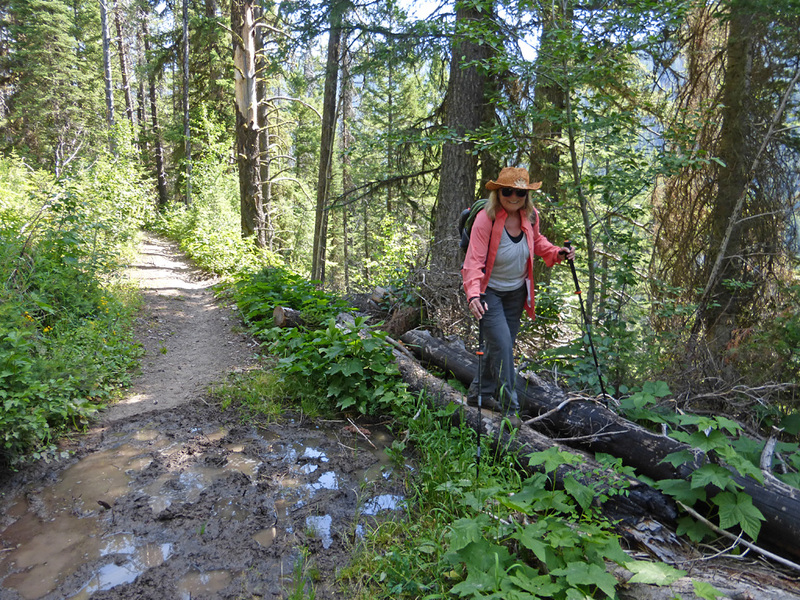 The second half of the hike is torturous and we go slowly, stopping often for short rests. Finally we stop altogether and rest for a good half hour, rehydrate and consume a few calories. Who told us that this was an easy hike and it’s mostly downhill??? They were lying!!! 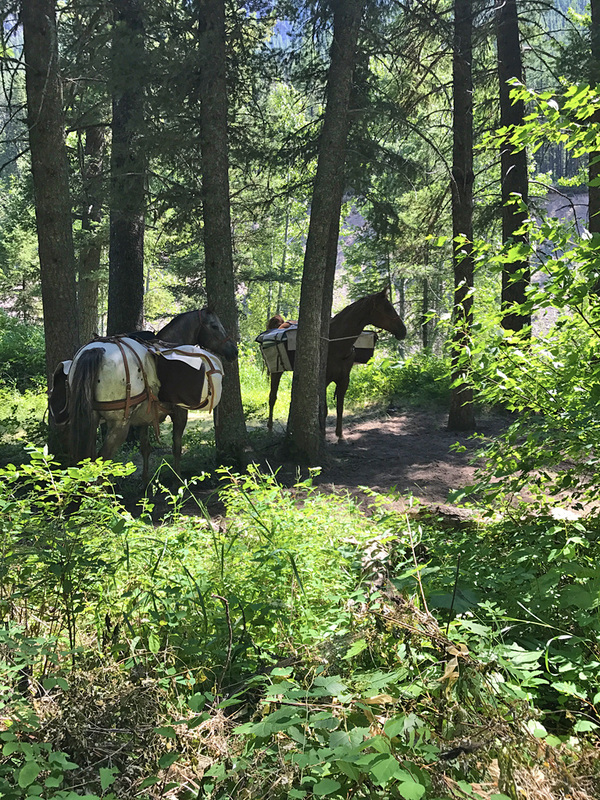 Finally we get to Granite Cabin and find Matt and the horses in a shady copse of wood enjoying the cool breezes. He tells us he was starting to worry about us. I feel my age and am a little embarrassed that we aren’t in better shape. But he is a kind soul and overlooks it, lying that he had only been waiting a little more than an hour. We know it was a lot more than that. The horses are tethered in the shade waiting for our arrival. Matt was not going to unload them until we showed up. We sit and rest and share stories. 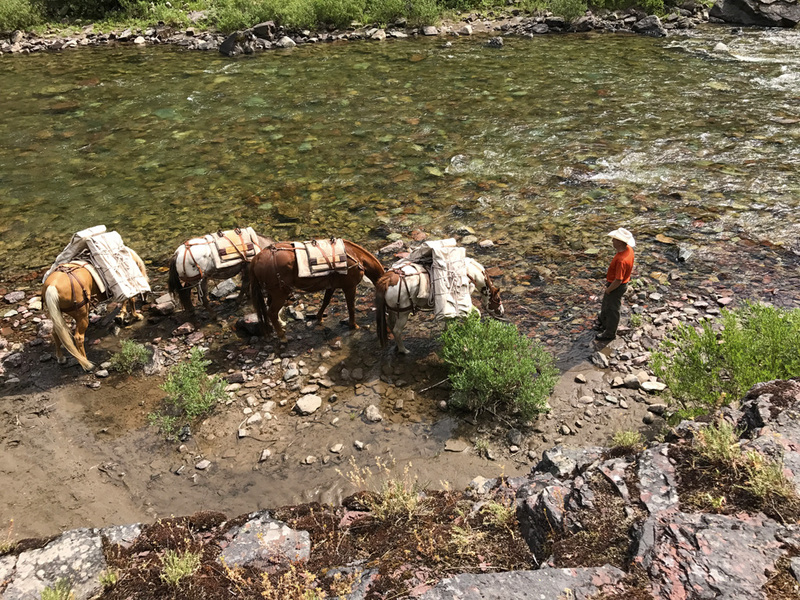 After we’ve had a little time to recover our energy, Matt takes the horses from their shady rest and starts unloading them near the cabin that will be our home for the next 11 days. I can imagine the horses are happy to have their 150-180 lbs of gear removed. Matt unloading the horses. I got some great funny-face shots of those characters! Take a look at Leroy on the far left. Happy giving me a big yawn! 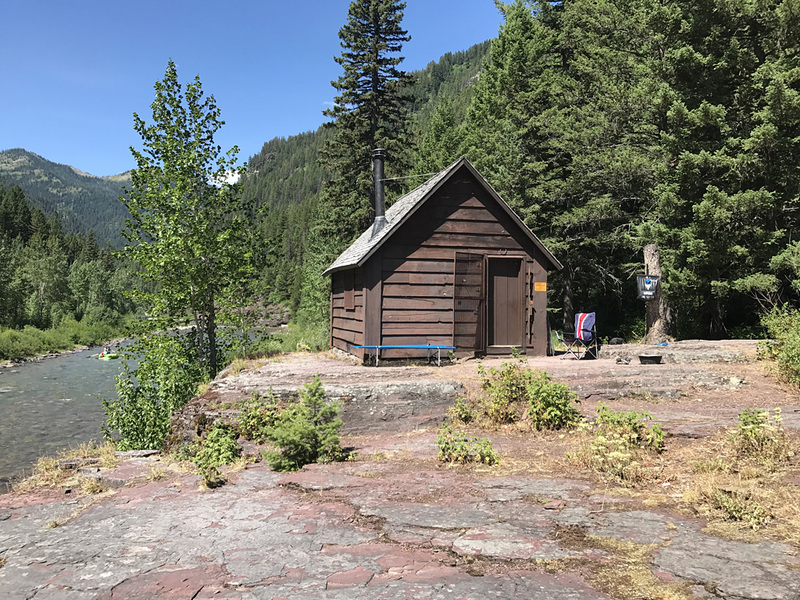 The cabin sits on a big flat rock overlooking the upper middle fork. 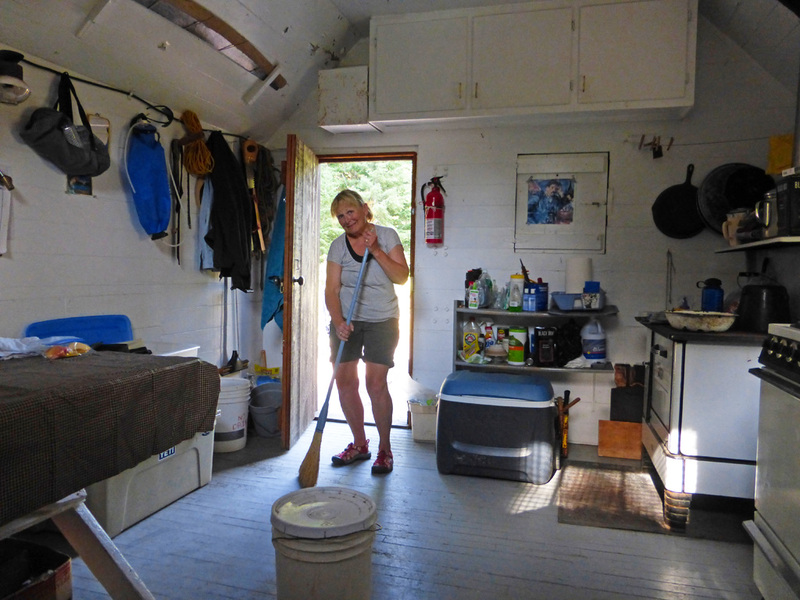 It’s midafternoon, the sun is blazing hot, and the cabin is like an oven. We start moving our gear in. We are dead tired and our brains are mush but we are happy to be here. We know a good night’s sleep will revive us. 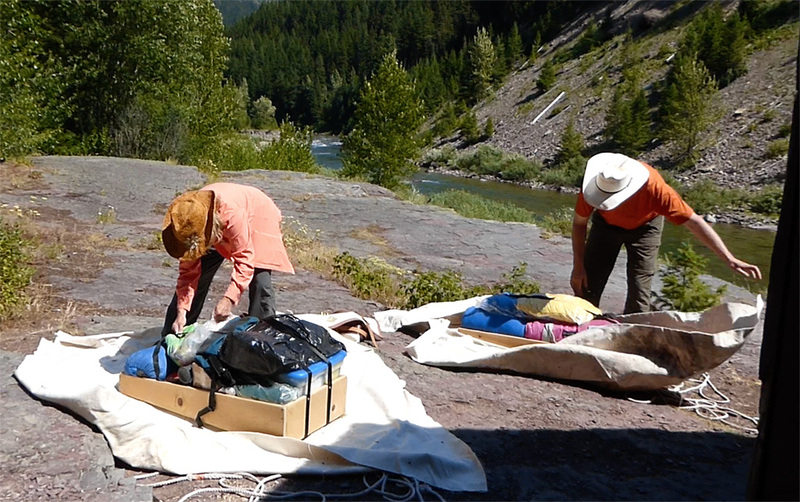 Unpacking the carriers with the middle fork of the Flathead behind Gini and Matt. Our home away from home for the next 11 days. You can see the protective grate to the left of the door. That’s supposed to protect us from possible nighttime bear encounters but only if you keep it closed. 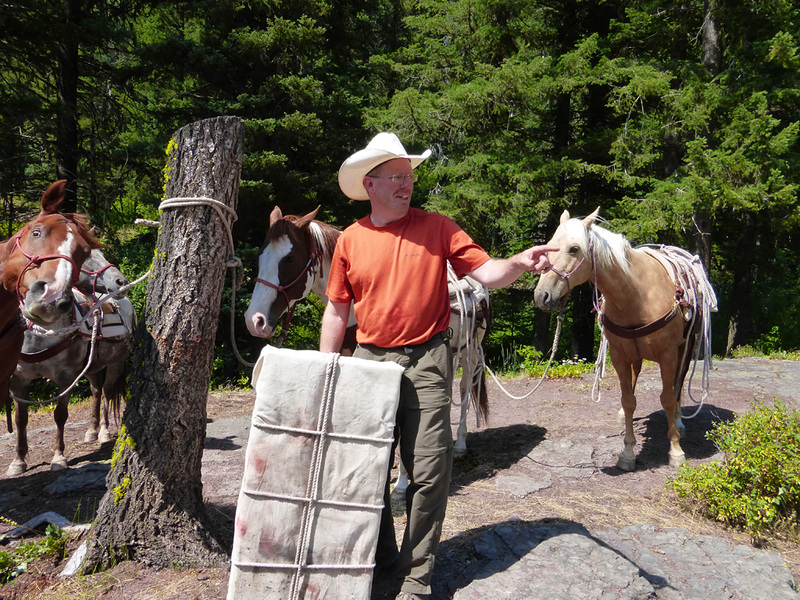 Matt watering the horses below the cabin before heading back up the trail. 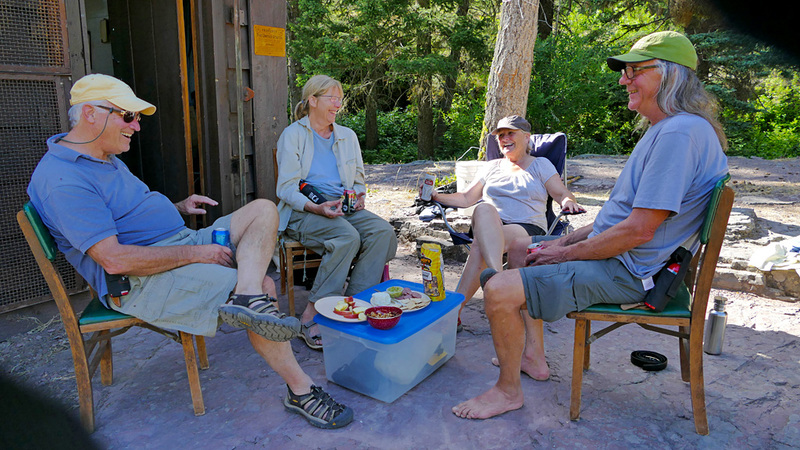 After a few hours of cleaning the cabin, moving our gear in and unpacking, we bring chairs out and sit out on our perch over the river to eat a delicious dinner of pasta salad that Gini has made and focaccia bread. We don’t feel like drinking…we are so tired. We have boiled a lot of water to sterilize it and we wash and rinse the dishes. Cleaning, cleaning, cleaning! Gini and I find that we are two kindred souls in how we like to keep our space. 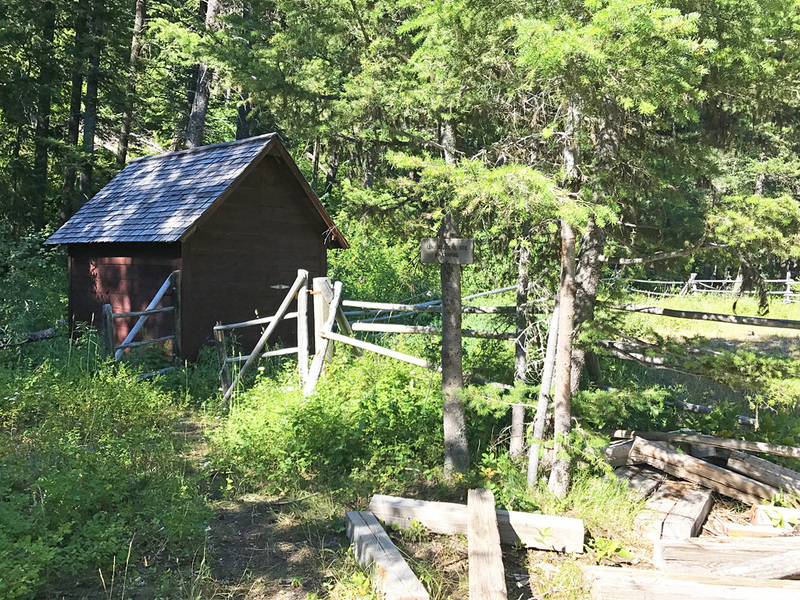 The cabin is still sweltering and we’re not sure how we will sleep in the heat. We try to be human fans with little success. We get a cot set up for Gini in the open space between the propane stove and small picnic table. I choose the lower bunk and we throw our extra stuff up on the upper bunk. We think we will read and write in our journals but it’s apparent that we have no more energy left. I go out in the cool twilight overlooking the river. Even in my exhausted state, I feel immense gratitude for those people who helped get me here, especially Gini and John. 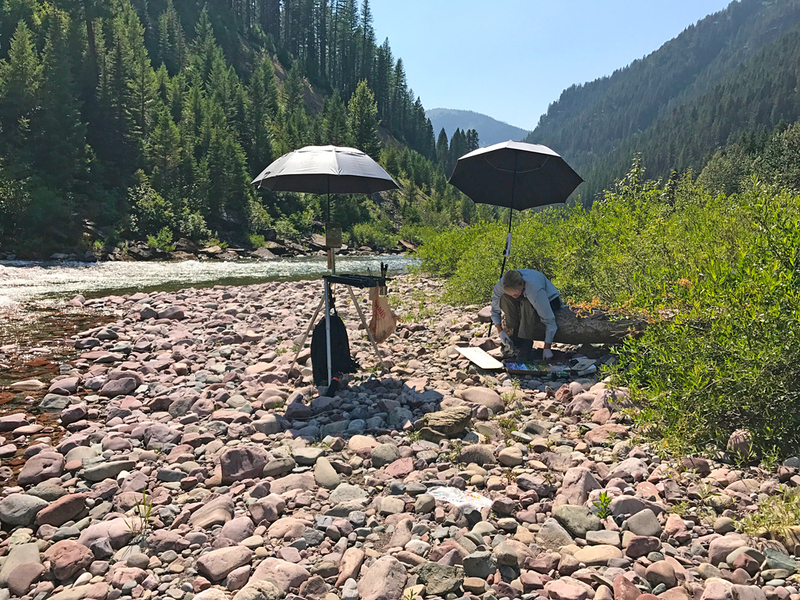 What a spectacular slice of nature… how incredibly beautiful it is at this moment with the slight breeze and the whispering river. Our humble home at dusk. 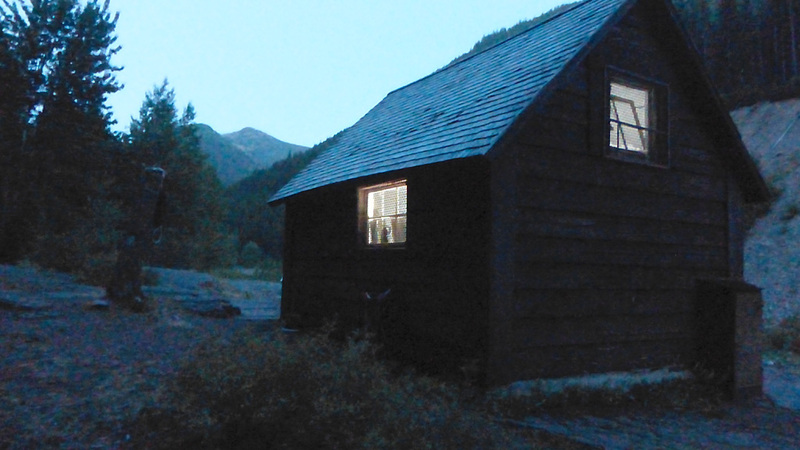 In the summertime here in NW Montana, the sun goes down about 10:30 and twilight lasts for at least an hour. Thank you! Your writing takes your reader/me along each hot, hard, pushing forward step of the way. Then there is the serenity of the night. All so very enjoyable! Thank you, Nancy. I’m finding with my painting that I also have a love for writing. It’s nice to pair the two together. I appreciate your comments! Thanks so much beach bunny! Can’t wait for the next installment! Love that you two did this! Thanks for coming along on the trail, Rainy! You girls are courageous! 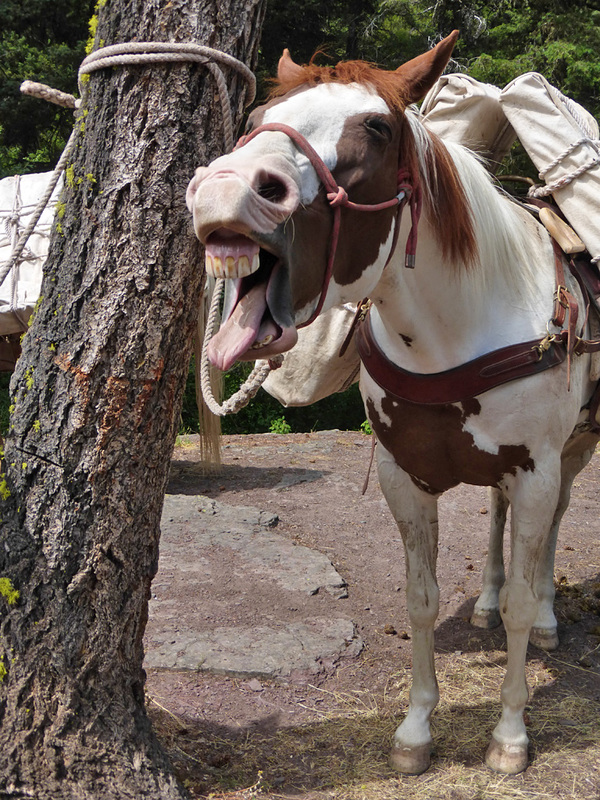 I think I may have felt a little apprehensive as I watched Matt and the horses mosey homeward down the trail without me! What a beautiful setting! We were both feeling apprehension to see our link with civilization leaving us but at least we had each other! Thanks for you comment!